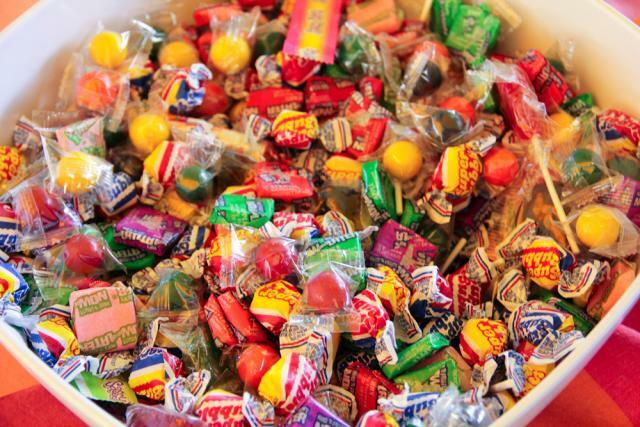 WHO Cares about How Much Sugar You Eat on Halloween? Are you going to be a witch today? Batman? Jedi? You're not alone according to National Retail Federation statistics on top costumes and Halloween spending trends. Last-minute candy shopping? Check out kidzworld.com’s list of the top 10 candies for Halloween. And of course, you have to plan your daily candy consumption to match the limits on free sugar recommended by the World Health Organization (WHO). The guideline says that no more than 10 percent of your calories should come from free sugars and that you can achieve increased health benefits by keeping the number below five percent. If you’re a good nutrition tracker, that should be no problem for you. 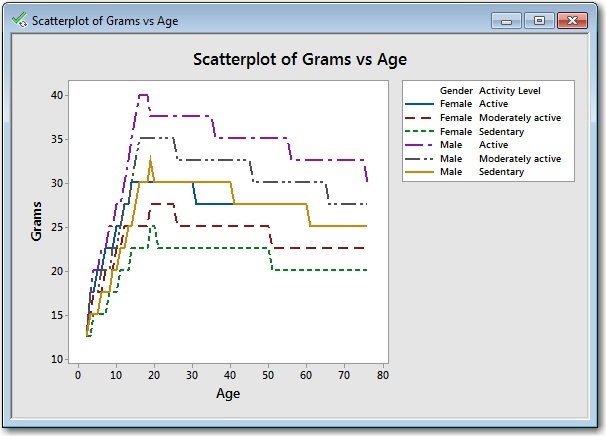 For those of you looking for more general suggestions, we’re going to make a scatterplot in Minitab that should provide a helpful reference. The USDA last published their dietary guidelines in 2015. Appendix 2 contains calorie estimates based on age, gender and activity level, rounded to the nearest 200 calories. Multiply those levels by 0.05 to get an estimate of your recommended sugar limit in calories. To change that into grams that you can find on candy labels, we’ll assume that sugar has 4 calories per gram. 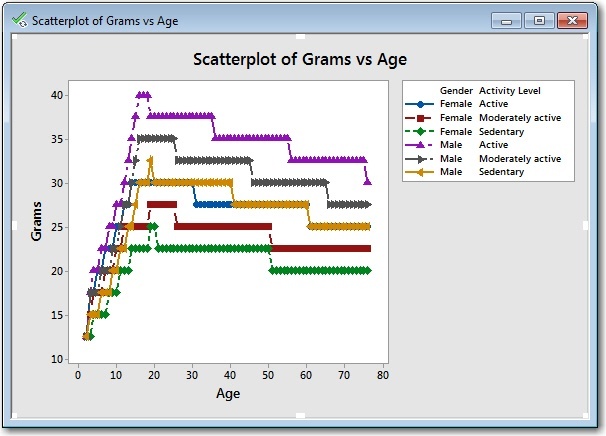 Without the symbols on the graph, the lines and the differences between them are clearer, especially when the lines are closest together during the early phase when people grow rapidly. Much has been made of the fact that the five percent WHO guideline is less than the sugar in a can of soda, so Halloween can be a treacherous time for someone who wants to limit their sugar intake. So what do you do if your ghost or goblin brings home more candy than you want? Natalie Silverstein offers some suggestions about how to make your candy do some good for others. The image of mixed candy is by Steven Depolo and appears under this Creative Commons license.